If you’re concerned about the quality of water in your home, you are probably considering a water filtration system. These units are used by homeowners to purify the water and make sure it’s safe for family and loved ones to drink and wash with. Once you have made the decision to invest in a water filtration unit, the next decision becomes which type of unit you should invest in. There are numerous types of water filters that are effective in their own way. Some filters are designed for irrigation purposes while others are better for purifying drinking water. Reverse osmosis or RO as it’s abbreviated is a water filtration process that removes impurities and bacteria from your water. 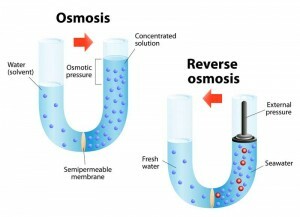 Traditional osmosis involves moving liquid from a low ion concentration to a high ion concentration, so you can imagine that reverse osmosis is the opposite. RO uses a special membrane to trap impurities, metals, and bacteria from your water. Deionized (DI) water is used for many purposes in addition to its residential use. Industries such as the auto finishing industry, textile industry, and pharmaceuticals use deionized water because it is clean and completely free of minerals or bacteria. The process to make deionized water is a two-step process. It involves passing the water over positive ions that remove minerals and metallic particles from the water. Once this is completed, the water becomes positively charged and must be exposed to negatively charged hydroxyl ions to cancel out the positive hydrogen ions and make the water completely neutral and safe to use. You will save money on purchasing bottled water, which will also result in the filter eventually paying for itself. You will have peace of mind that your water is completely clean and safe to use. An RO filter removes up to 99% of dissolved solids in the water. Your water will be free of harmful minerals and impurities that may make it taste bad. They can even remove chlorine. RO filters are known to waste water, which may result in a higher water bill. Some experts insist that these filters remove trace minerals that are actually good for us and make the water taste better. The membrane of an RO filter is quite porous. It may let through larger particles. Many homeowners with RO filters use a secondary filter to make sure they are completely covered. For more information on RO and DI filters in Annapolis, MD, call Heidler, Inc. today at (410) 268-7191.